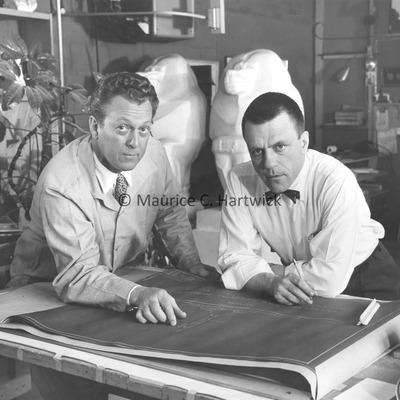 Marshall Fredericks and architect James Hughes pose with an architectural drawing for the "Cleveland War Memorial: Fountain of Eternal Life"
Marshall Fredericks and architect James Hughes pose with an architectural drawing for the "Cleveland War Memorial: Fountain of Eternal Life" with plaster models for "Male Baboon" and "Female Baboon". 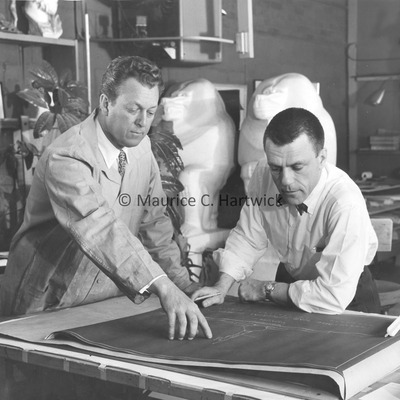 Marshall Fredericks and architect James Hughes discussing an architectural drawing for the "Cleveland War Memorial: Fountain of Eternal Life"
Marshall Fredericks and architect James Hughes discussing an architectural drawing for the "Cleveland War Memorial: Fountain of Eternal Life" with plaster models for "Male Baboon" and "Female Baboon" in the background. 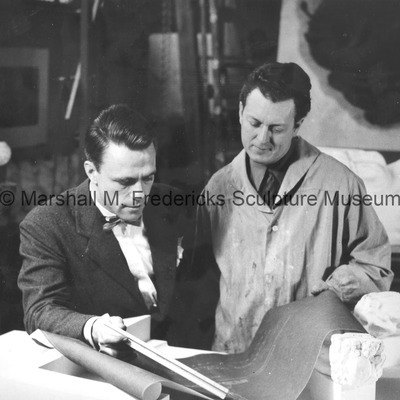 Architect James Hughes consulting with Marshall Fredericks regarding the "Cleveland War Memorial: Fountain of Eternal Life"
Architect James Hughes consulting with Marshall Fredericks regarding the "Cleveland War Memorial: Fountain of Eternal Life".